Ever feel like Christmas can get a bit too fluffy and cosy and just too sweet? Cure your seasonal nausea with a bit of first class frights! Let horror author and aficionado Mats Strandberg guide you to the best spooky literature this December. 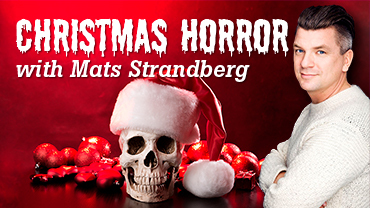 Mats will talk about reading horror, being a horror author, and recommend favourite books. Also time for book signing and a Q&A. Welcome to a terrific horrific night at The English Bookshop in Uppsala! Tickets 60:- Get your ticket at the bookshop today – limited space.